Pabst Is Now Making Pseudo-Craft Whiskey: "Not Your Father's Bourbon"
The last few years were a weird time for the “malternative beverage” segment of the alcohol industry. In a surge not seen since the heady days of Zima and Smirnoff Ice, the “hard soda” craze sprouted up seemingly overnight, driven initially by the huge success of Not Your Father’s Root Beer. Numerous imitators then jumped into the fold, including hard soda brands from both macro (AB InBev) and craft (Boston Beer Co.) sources. Everybody wanted a piece, although that market now seems to have receded as quickly as it came. The biggest mystery, at the time, was the source of the original phenomenon: the Not Your Father’s Root Beer creators, Small Town Brewery. Who were these guys, with their fake-sounding brewery name? As it turns out, the tiny operation at Wauconda, Illinois was indeed legit—they were the original creators of the hard root beer, and they still create it today, in a variety of formats that apparently go all the way up to a ridiculous 19.5% ABV. However, they’re not the ones making the Not Your Father’s Root Beer that you can find in any local grocery store. 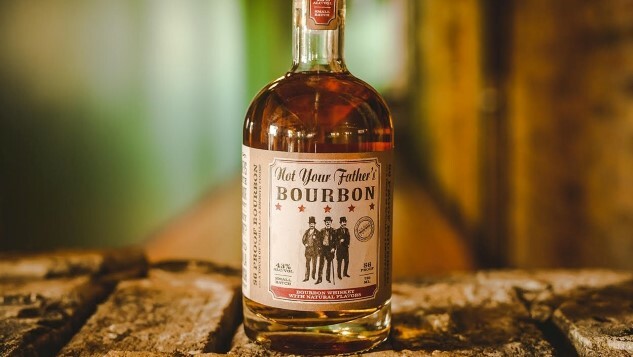 Pabst is now looking to take that line of thinking to the next level with the introduction of a spirits program, starting with Not Your Father’s Bourbon. The 86 proof (43% ABV) whiskey is being produced in Monroe, WI at the Minhas Distillery, which contract distills for a variety of companies in addition to contract brewing in the beer industry. This will all be under the name of “Small Town Craft Spirits,” with no mention of either Minhas or Pabst. Chicago’s Innovative Wine & Spirits will market, sell and distribute the bourbon. The folks at Small Town Craft Spirits celebrate the rich history and heritage behind bourbon, but are excited to launch an option with a unique flavor twist and finish, different from what is expected. While most flavored whiskeys taste more like the flavor than the whiskey, Not Your Father’s believes that the whiskey is the most important part. A touch of Madagascar vanilla is added to enhance the flavor, not mask it. You know what the most effective way might be, if your goal is to “celebrate the heritage behind bourbon,” and you believe that “whiskey is the most important part”? You might consider creating an actual bourbon that doesn’t feature added flavors and added sugar. Just a thought. Not Your Father’s Root Bere is already available in 750 ml bottles in Wisconsin and Illinois, at an MSRP of $29.99. Pabst, via its Innovative Wine & Spirits agreement, is planning to launch the product nationwide in the first quarter of 2018. So get ready—you’re probably going to be seeing a heavy marketing push for Not Your Father’s Bourbon, come February.